Below is the text as written for the Fair Vaue column by Harriet Hedley. THERE is a treasure trove of art in SA homes, and even today there are people privately disposing of their possessions without realising their true value. 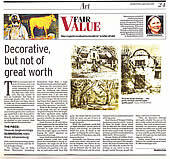 Business Day has started its own art "roadshow", Fair Value, to encourage people who own heirlooms which have not been valued, to make use of our panel of experts - from well-known curators to well informed art collectors. The results could be startling and an article bought for a few rand years ago could fetch a few thousand today. As our first submission illustrates, though there is a material value attached to your treasure, there maybe a greater historical value. Molly Ward of Johannesburg recently presented Fair Value with five Tinus de Jongh etchings. The etchings were of Malta House, Observatory, Steynsberg, Homestead, Cape Flats, a Cape Dutch homestead, and a barn gable. Ward says she remembers these etchings displayed in their home since her childhood and believes they must have been acquired some years before that. "I am sure they have been in the family for at least 50 years, if not longer. But the interesting thing is there appears to be some mystery about the authenticity of some of the signatures," says Ward. Three of the etchings are signed by De Jongh, but two are marked "original etching by Tinus de Jongh". The latter signatures seem slightly different to the others and begs the question whether the signatures are that of the artist or his agent. Esme Berman, in Art and Artists of SA, points out that one of the first public exposures of art fraud was recorded in Cape Town in 1934, when De Jongh's agent was tried for forging the artist's signature on thousands of etchings. Louis Woolf admitted that he had signed between 3 000 and 5 000 prints, but insisted that it was by arrangement: De Jongh ran off 50 to 100 prints from each plate, then sold it to Woolf, who paid him a 50c royalty on each print made from that point. The dealer told the court that while the artist was out of town in 1928, he had given him permission to sign the prints. While the magistrate could find no legal precedent "on the point of forgery and uttering", he ruled that Woolf was guilty of "fraud on the public", as forging the artist's signature could have been done only with intent to deceive. Technically, says Berman, prints made from artists' own plates cannot be forgeries, but abuses do occur. Prints were made from woodcuts by Pierneef after he died, but the blocks destroyed, and the prints stamped with an authorised imprint of his signature. Brett Martin of Westgate Walding Auctioneers says the words, "original by Tinus De Jongh", always struck him as odd and one could assume that those etchings so marked could be the extra copies made. De Jongh's etchings can fetch anything between R600 and RI 500 on auction. Harriet Hedley of Gilfillan ScottBerning, who did the appraisal, says the etchings are typical of De Jongh's works. She does not believe the extra copies will affect the market for the etchings to any extent as they are bought mainly because people like them, and not as investments. "They are decorative although not hugely valuable. You can see the plate marks so they are definitely not modern. They were produced commercially for decorative purposes, but they are rather nice actually and I like them," says Hedley. "The prints are clear and the quality of the paper is good, although one has had some exposure to the sun." Hedley values them at between R300 for the smaller prints to about Rl 000 for the larger ones.